Now, if everyone knows that the model is wrong- why waste time building it? The answer is very simple. It is not the answer but the approach and the assumptions. This helps investors verify that you have thought through things like unit economics (how much can you charge per seat? What will be the number of seats per customer? ), business strategy (how many customers do you expect to have? what is the average deal size? ), spend characteristics (what is the cost of building a product? what is the sales and marketing plan?) and that you made sure the business model works. One of the biggest turnoffs is a financial model which shows the team just doesn’t understand the space. For an early stage company, building a financial model should be pretty simple. Since the model is inherently incorrect then there is really no need to over complicate it or present false accuracy. The problem is that this is exactly what your banker is likely to do to justify his fees / commission. It is better to admit the model is still work in progress and is intended more as a thought exercise than anything else. Even worse, when you outsource this to a banker you miss the key benefit of building a financial model – understanding the fundamentals of your business. 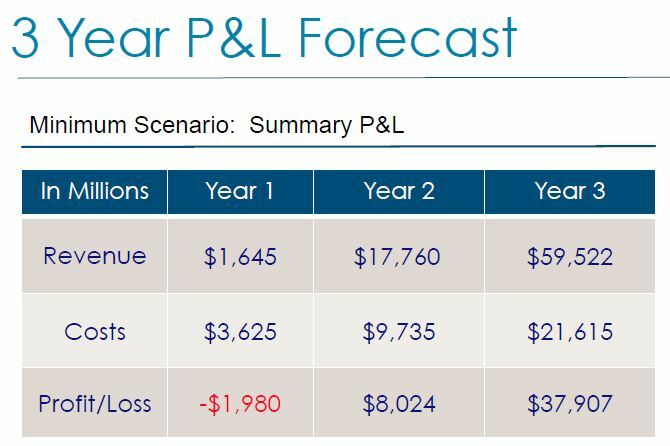 Here is the 3 year P&L I got from a company that is building a marketplace for Real Estate professionals to offer their services. If anyone has ever built a marketplace, they would know it takes a long time to generate revenue. Moreover, I don’t think that in the history of subscription model there has been a company that generated $60M in revenue and $37M in EBITDA in 3 years!!! One last thing here, if it costs you “just” $2M to generate significant profit- it probably means the barrier to entry is too low. Too many times we hear “this is the last round of financing” when the company is pretty early or in a space which is known to require a lot of capital. The truth is that for almost all early stage companies things take longer than expected and they don’t meet revenue plans. Making things worse is that most companies spend much more than they originally anticipated. Moreover, even if everything goes extremely well then in most cases you will want to raise more money to double down on the opportunity ahead before competition catches up. You might ask yourself why would anyone want to overestimate cost. The quick answer is typically to justify a larger round which is another way of increasing valuation. When you try to estimate cost for the following year ask yourself how many sales reps do you have today and how many can you really hire in a year. Same question goes for developers, marketing people, support reps etc. It takes time to find strong talent and it gets more difficult to do so at scale. So either you plan to lower the bar or you will just not be able to ramp up hiring as quickly as you think. So don’t underestimate the importance of building a model by yourself. If done right, it will force you to think about key business questions long before you encounter them. Next: Next post: So you want to kick SaaS?